MedTorque has introduced Tri-Gear silicone handle ratchets in Europe, developed for use in orthopedic and spine surgeries. The company recently received CE mark approval for Tri-Gear handle ratchets, allowing the firm to market the products in Europe and other countries that accept CE mark. MedTorque president and CEO Steve Sundberg said: "In light of the overwhelmingly positive response we’ve gotten from our OEM customers and surgeon users in the United States, we very are excited to introduce our TRI-GEAR products in the European market. "We look forward to offering this innovative product line along with our high standards of performance and customer satisfaction to European customers and surgeons." The patent pending Tri-Gear technology uses three gears with 20 interlocking teeth, which enables both forward and reverse functionality. Traditional ratcheting instruments currently used in orthopedics use two-pawl design with one or two teeth engaged for each direction, while most of the components in Tri-Gear ratchets were standardized for use across various styles and sizes. 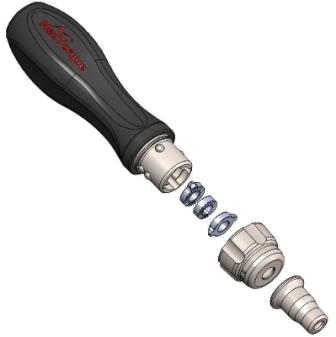 The ratchets, which are available axial/in-line, t-handle and palm styles, can be customized with color, logos and artwork. Sundberg further added: "Receiving the CE Mark and launching our flagship product, Tri-Gear, in Europe is a significant milestone for MedTorque and another step in our continued investment in the medical device industry." MedTorque provides customized and highly-engineered component parts, instruments and complex assemblies for medical device OEM’s. Image: MedTorque Tri-Gear ratcheting instrument. Photo: courtesy of PRNewsFoto / MedTorque, Inc.